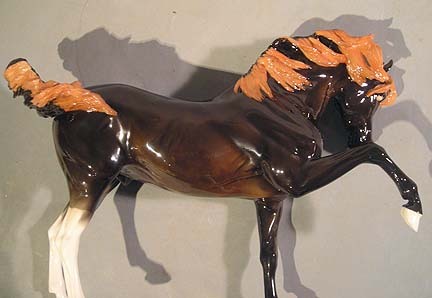 I airbrushed the entire horse with black overglaze, lightly or deeply covering the parts of the horse as needed. That “tomato” color underneath now gives this piece that gorgeous richness coming through instead of just a flat black. Because I will want the tips of the mane, tail, and forelock to be sharply defined, I cleaned off the black overspray on the ends of those areas before firing this stage. That’s why right now those parts look too light and stop too abruptly. But that’s OK, because the next step is to deepen the tips with russet color and then shade with black and merge into the rest of the mane/tail/forelock. By the way, I need something to hold onto during this process; that’s why the back legs haven’t had any paint yet. Now that the front legs have color I can paint the backs, and the black color will seamlessly blend with the rest of the body. 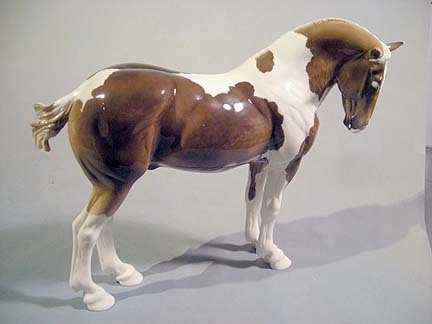 And here’s a dappled flaxen chestnut pinto Boreas, also to be finished this week. I shot him a little from the top to show off the pretty white marking which flows into the top of his tail, so he looks a little foreshortened in perspective. PreviousAttack of the dappled tomato! NextThe Tomato… not any longer!